Now when someone is required to plant street trees, this is what I want to see. 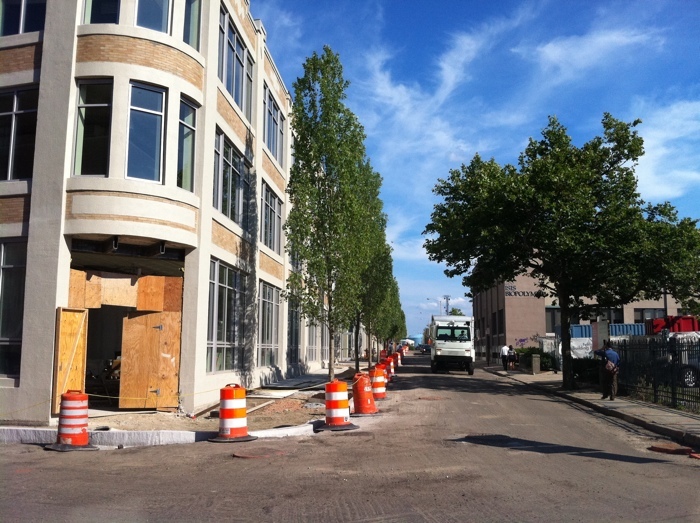 Those are all brand new trees on the left outside the soon to open Brown Medical School in the Jewelry District. Not only are there numerous large new trees here, the parking lane has been removed to widen the sidewalk! I’m pretty sure these trees will end up being a What Cheer at the end of the year. Well, brown has often worked it so the PNPP provided them with trees, but damn those are not PNPP trees! Nice! I almost thought that was one of those magical renders where the trees look SO BIG. But they’re actual trees! The city should take note on this when the trees are replaced on Weybosset Street/Empire Street after the construction is complete. And since I’m on that topic; let’s discuss street trees on Washington Street – it’s much-needed. Jen, what is your concern regarding the road, the roots, or trucks/cars hitting them? Perhaps they could install some bollards to protect the trees from errant vehicles. The verticality of this species (what are they, I rather love them in the city), makes sense since the streetcar is proposed to go here and these trees won’t interfere with the streetcar wires. We could use the streetcar stops to get some trees. If we extend the sidewalks into the street at the streetcar stops, we could plant trees in those sidewalk extensions while we’re at it. There is a streetcar stop proposed on Washington at Mathewson. We could have trees infront of the Narrow Building and along (what is now) the ProJo parking lot across from it. Brown did a great job of bringing in (mid-growth?) trees for its landscaping of the newly opened Granoff Center for the Creative Arts on the east side. Looks as if they’ve been there for the last 5-10 years. The vegetation is very full and the terraced green is a great summer evening treat. Cool and comfy. If you’re lucky you may stumble upon a theatrical production or vocal rehearsal taking place within the atriumed building, viewable from the green. Kudos to Brown Dept. of Planning. We like trees! Jef, i don’t know what they are, go get a closer up pic of the leaves. There are a lot of species of tree that grow columnar as opposed to fat apple, and the columnar maple is one we’ve used in PVD before in tight spaces. Seems the vision of the district’s future was the prime mover with this design. If this is what to expect from the planning and implementing,then this will certainly be an excitng Knowledge District ! The leaves are all fairly young and it is hard to tell what variety of maple however. I assume (hope) a sugar maple with less invasive roots because the tree wells are not huge. The sidewalk is pavers and Norway or Silver will make the walk a disaster, and then someone will decide to cut the trees. The trees are set about a foot back from the curb (they are also putting in new curbs). I wouldn’t worry too too much about car damage. They look like 8″ caliper or so already so little dings shouldn’t hurt too much. I have pics I will send to Jef.